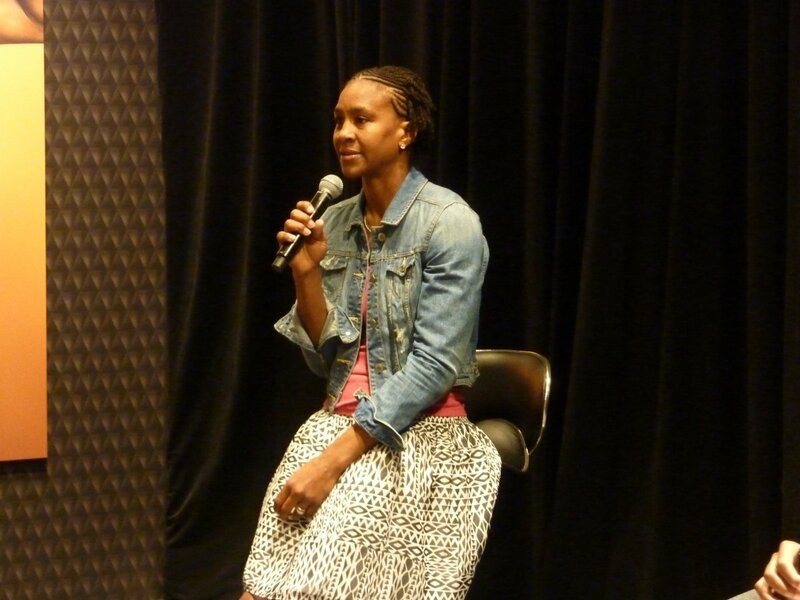 Tamika Catchings will retire at the end of this WNBA season – her 16th. Photo by Sue Favor. Basketball legend Tamika Catchings brought her Legacy Tour to Los Angeles last Wednesday with an event that drew a dedicated group of fans. The Indiana Fever star will retire at the end of this season after 15 years of WNBA play. She holds numerous league records, guided her team to a Championship in 2012, was league MVP, and defensive player of the year a record five times. She has spent her entire career with the Fever. 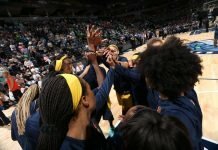 Catchings’ and her Catch the Stars Foundation are conducting a post-game fundraising party in each of the 12 WNBA cities this season. 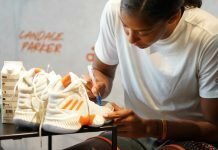 In auctioning off Catchings memorabilia, the goal is to raise $2,000 for a charity in that city which promotes fitness, literacy and mentoring, similar to her Foundation. 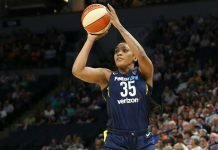 The partnership will also pave the way for Catchings to expand Catch the Stars throughout the country, as she will return to each city in the fall or winter to conduct a fitness clinic. Ebony Hoffman speaks to the crowd. Photo by Sue Favor. 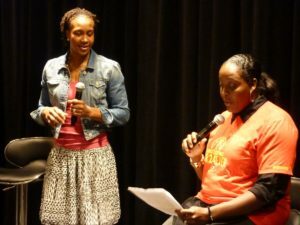 The Los Angeles event was hosted by Catchings’ former teammate and good friend Ebony Hoffman, whose humorous and easygoing demeanor set a warm tone for the evening. Catchings explained that she began thinking of retirement two years ago when she hurt her back and had to sit out several games at the beginning of the season. She said she will miss playing for the Fever, but she is ready to move on to the next chapter in her life. 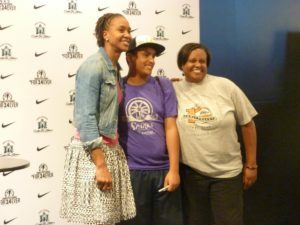 Tamika Catchings took time to talk with fans and take pictures. Photo by Sue Favor. When asked about her college coach Pat Summitt, Catchings said she was glad she got to see her shortly before she passed away June 28. Catchings said she had wished Summitt would just open her eyes and get up; start walking, and everything would be alright again. The video of the introduction and question and answer session is below. Afterwards, Catchings signed autographs for fans and posed for pictures. Almost all of the Los Angeles Sparks players came through to say hello to Catchings. Sunday marks the eighth stop on her tour, in Seattle with four more WNBA cities remaining.